Simon Battersby Consulting Ltd: Professional Website Designer who developed the Dartefacts site for me. After several failed attempts of my own trying to create a ‘Dartefacts’ website I finally decided to employ the services of a Professional. I can thoroughly recommend Simon Battersby Consulting Ltd.
Peter and Karin Brooks: Peter and Karin have had a massive impact on the development of the site – both in terms of ideas to make it more user-friendly as well as adding an enormous amount of content (data, photos, corrections etc.) Further it was Peter and Karin’s interest in ‘Square Bagging’ (i.e. visiting EVERY 1km Ordnance Survey Grid Square within the boundary of Dartmoor National Park’ that led to a a brand-new activity within Dartefacts. Square Bagging on Dartefacts has proven to be such a superb and friendly way of ‘navigating’ around the Dartefacts Dartmoor Map that it has now become the main method for using this website. Thank you to you both! I do try my best to acknowledge where I get my information from but Dartefacts started many years ago as a personal ‘GPS database’ so back then I didn’t bother to keep ‘references’ as to where I was getting all my information from. It was only years later that I realised others might want to have access to all this data! So, if you think some of my data has come from you or another source and you believe you can help me ‘fill’ my referencing ‘gaps’ I would be very happy to hear from you and add credit where it is due. Due to the size of the database references and acknowledgements cannot be added to specific dartefact items but are instead placed on this page. Dartmoor Military Firing Range Schedule. 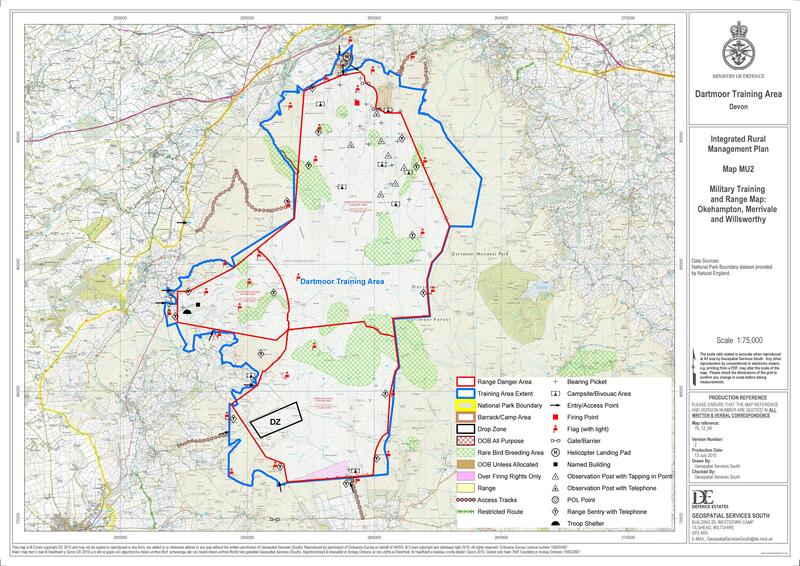 Dartmoor Military Firing Ranges Map. (use ctrl+mouse scroll wheel to zoom in). DartCam: Image of Dartmoor RIGHT NOW! Dartmoor National Park Permitted Wild Camp Areas: An Ordnance Survey map showing areas permitted for camping. Very high level of zoom – a close 1:25 – so it’s also very useful for studying the moors from an armchair whilst planning your next camping adventure! LIDAR Map of England and Wales: An utterly absorbing experience! The Environment Agency released their LIDAR (Light Detection and Ranging) data under an Open Government Licence and the person who runs this website has combined the ‘strips’ together. Simply stunning. British National Grid Map: 4 fig. NGR on each square! Where’s The Path? : Map gets ‘used up’ quickly! Side by Side: Awesome! Provides 10 fig. NGR! I use this all the time to establish items from old maps (like Bench Marks) as well as from the satellite imagery. There appears to be an inaccuracy of approximately 10 to 15 metres in the 10 fig. NGRs provided. Add 10 to 15 metres North (and possibly a few metres to the West) for a more accurate result. You can acquire the NGR for a map item by hovering over it with your mouse and the ten figure NGR will appear on the bottom corner. Magic Map: Amazing levels of zoom and ability to add ‘layers’ of different ‘geographies’ (i.e. aerial photography, OS mapping, geology etc.) A quite stunning application – and an excellent ‘mouse click’ option to find ten figure grid references! Dartmoor Maps Offline: iPhone and iPad. Grid Reference Finder: Very nice grid reference management tool. Geograph Map: This site is proving very useful for acquiring 10 fig. NGR from Ordnance Survey 1:25 k Maps. ‘Find Grid Ref’ Dartefacts: The Dartefacts Grid Ref Finder – courtesy of Simon Battersby Consulting Ltd. Only accepts mouse clicks for selecting, but touch screens can navigate around the map. Old-Maps.co.uk: Very similar to side-by-side in that this site provides zoomable old maps to easily view. I have found quite a few B.M.s (Bench Marks) on these maps that don’t appear on side-by-side maps. Unfortunately there does not appear to be a feature to ‘extract’ the NGR for items that appear on the maps, unlike side-by-side. Prehistoric Dartmoor Walks (PDW), Dartmoor 365 Resources Page: Dave Parks provides a link for every 365 page to an Ordnance Survey Map that displays a graphic square showing the one-mile area covered. Genius. Dartmoor Tinworking Research Group (DTRG) Tinners’ Map: Murray Oates. Used extensively for tin category and data. Now held within the pages of the Dartmoor Tinworking Research Group ( DTRG). Brilliant use of a Dartmoor map with map dot icons that allow a pop-up of the tinner hut with photo and further data – including dimensions. Prehistoric Dartmoor Walks (PDW): Dave Parks. Used extensively for Prehistoric category and data. Dartmoor Crosses: Maurice Daniel & Glenn Bearne. Used extensively for the Crosses category. Prehistoric Monuments of Dartmoor: Bill Radcliffe. Used for further Prehistoric information – very good at listing monuments that no longer exist – they might one day be found! Extensive Listings. Dartmoor Archive: ‘The Dartmoor Trust has financed the digitisation of this important historic collection of photographs taken by the author and antiquarian R. Hansford Worth between the 1880s and 1940s, the originals held by the Torquay Natural History Museum. The Trust has contributed £6500 to this work, eventually resulting in around 5500 images being added to the Dartmoor Trust Archive for public view.’ (text quoted from the Home Page of the Dartmoor Archive). Dartmoor CAM: Keith Ryan. Used extensively for further information – a blog of group walks, very informative and often with 10 fig. NGRs! Legendary Dartmoor: Tim Sandles. Used extensively for further information – if it’s not here it’s probably not anywhere! The definitive ‘go to’ online resource for Dartmoor history and information. Dartmoor Walks: Richard Knights. Used extensively for further information. Great for walk ideas! Waymarking.com: Dartmoor Granite classification. Many Dartefacts ‘found’ here! You do have to join up to gain access to the gps/kml etc. files. A great resource but not easy to search. Dave Bellamy: Used for some tor and hill, trig point and car park locations. Website has been down for some time. Tim Jenkinson: Flickr: So many tors! Great for lesser known tors. Tim Jenkinson: (Dartmoor Oddities) Flickr: More specific. Keith Parsons (Google Maps): Initial PCWW (Plymouth Corporation Water Works) Granite Posts’ grid references and information taken from a survey carried out May/June 2010. This data was superseded when I discovered the Plymouth City Council data (below) – however it proved very useful in early explorations and provides a Google map of most PCWWs (which Plymouth City Council does not). The Milestone Society: Vast number of items available as downloads to view on Google Earth or as Spreadsheets. Milestones, Crosses, Bound Stones etc. etc. – wow! A treasure trove of data! Moorland Walker: Paul Buck. Excellent ‘tors collection’ and entertaining Blogger. Dave Hamnett: Dave has very generously provided Dartefacts with the National Grid References for the WD and PUDC boundary stone collections and continues to provide information for many other items. Peter Cook: Has kindly provided numerous corrections to those very rare errors within Dartefacts (!) as well as helping to add content to the Dartefacts descriptions. Always appreciated! Dartmoor Magazine: I only need 3 copies; 112, 113 and 114 to complete my set! Anyone out there want to part with their magazines!? Reasonable offers considered! :o) A great magazine with many, many articles that often provide grid references to ‘items’. The letters section frequently reveals little known ‘finds’. Dell, S. & Bright, J. (2008) ‘Dartmoor’s Sett Makers’ Bankers (An industrial mystery solved? ), The Dartmoor Company: Published book used for many of the listed ‘Bankers’ in the Sett Makers’ Bankers Classification within Dartefacts. At the back of this book is an excellent listing of 110 locations of Bankers (with 4 errors). Peter & Karin Brooks: Peter & Karin had kindly supplied many bits of information and corrections to the site – but have recently come on board and now provide many of the Dartefact pages with their own photographs and further information. Additionally they came up with the ‘Square Bagging’ concept. Johnies Meanderings: Johnie Stickland. A truly excellent Blog, informative, fun, interesting and a number of ‘Dartefacts’ that I haven’t seen listed anywhere else!? Often provides grid references. Loads of great walk ideas! Dartmoor News: Paul Rendell. Another great read! I almost have the ‘full set’ of these (only missing issues 1 – 13!) There are often great ‘treasures’ to be found within its pages. If anyone has any of those ‘early’ copies I would be very interested in purchasing! I did get my hand in one of the photo galleries once! Fame at last! Nick Udy: Photographer. Has kindly offered to share a number of his excellent images within the Dartefacts website. Look out for his spectacular work on some of the ‘headers’ (top of page images). Tinners’ Buildings Research Project: This link no longer works – but once seemed to indicate that the DTRG group were embarking on a systematic and highly detailed survey of all Dartmoor tinner huts? Maybe this will be revealed again in the future? I will keep this link here just in case DTRG decide to continue this excellent idea. British Film Institute ‘Britain on Film’: Dartmoor: A fabulous and free video library resource. Many archive films of Dartmoor. Moors and Tors: ‘Walking for health and happiness on Dartmoor in all weathers and over all terrains’ with Liz Miall, an enthusiastic local guide. Dartmoor’s Daughter: ‘Explore. Learn. Enjoy. Walks & Nature Connection Experiences for Transforming Health, Wellbeing & Performance’ with Emma Cunis. Total Number of Dartefacts: 3605 items. One long winter I will add in all of the books I have used/ own here, together with a scan of the front cover.. but for the moment I have abandoned this huge task!